Display your listing in our member’s directory where potential clients and fellow VAs can locate you by name, state, or multiple search criteria. EOMs are monthly informational sessions held in the IVAA chat rooms. Experts in fields such as managing a VA business, marketing including getting clients and leveraging social media, and tips on using favorite applications to name a few. These valuable sessions are not to be missed. Check out the website for more details! All members in the IVAA have the opportunity to have their business featured on the website and in our e-newsletter, The IVAACast. The Members’ Only Area of the website has an extensive collection of forms and resources to help you get started in your business. IVAA members can have links posted on the IVAA website to press releases about themselves and articles in which they have appeared or been quoted. Virtual Assistant Connections are an excellent way to network with VAs and aspiring VAs in your local area. They are open to all IVAA members, including international members. 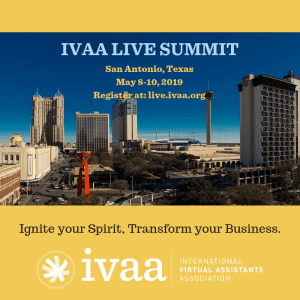 These IVAA-sponsored events usually take place over lunch or dinner and often result in valuable connections that help VAs grow their businesses and our industry. VACs are announced on the message boards, in the IVAACast, and at ivaa.org. IVAA’s monthly newsletter helps you grow and maintain your business while keeping you up-to-date on the latest in the VA industry. Discounted advertising opportunities are available. One of our most talked about benefits! Keep in touch daily with fellow IVAA members, ask questions and discuss the latest information and technologies available to VAs today. An opportunity for aspiring VAs or VAs new to a niche to connect with and learn from a seasoned VA who’s been there. The Preferred Partners Program offers members exclusive discounts on products & services from an elite list of qualified vendors. From computer help to software discounts, check out the PPs in the members-only section of the website today! Members can become Preferred Partners too – see the application at ivaa.org. These webinars are held ten times a year and are intended for members to learn a skill in 3-5 steps – new skills to help you with your business. They are 30 minute presentations and are recorded and uploaded to the IVAA website for viewing and an opportunity for all members to lead them and share their skills! Bid on projects that have been submitted to our RFP system by clients who are looking for a VA.
Our yearly live and online conferences (Summits) provide a place to learn new skills with professional speakers and break-out sessions on a variety of topics while getting to know and network with other IVAA members. See www.online.ivaa.org and www.live.ivaa.org for upcoming dates and programs. Ready to JOIN NOW?? Click here to get started as a Member with IVAA.